CHAMPAIGN, Ill. — University of Illinois engineers built a 3-D printer that offers a sweet solution to making detailed structures that commercial 3-D printers can’t: Rather than a layer-upon-layer solid shell, it produces a delicate network of thin ribbons of hardened isomalt, the type of sugar alcohol used to make throat lozenges. 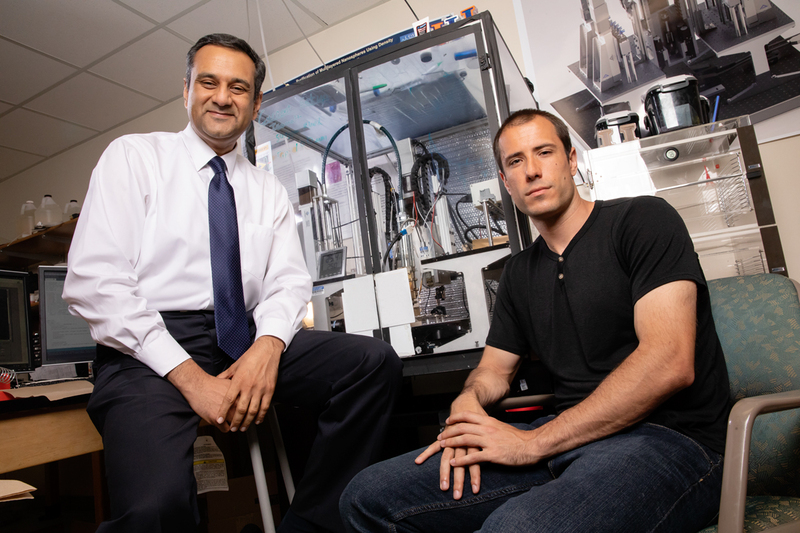 Illinois professor Rohit Bhargava, left, and Ph.D. graduate Matthew Gelber developed a free-form 3-D printer that can create scaffoldings out of sugar for tissue engineering and manufacturing applications. The machine prints free-form, the melted sugar hardening in the air as it prints. In a paper published in the journal Additive Manufacturing, the research group described the materials and mechanics of free-form isomalt printing. Free-form means that as the nozzle moves through space, the melted material hardens, leaving a sturdy structure behind – like drawing in midair. Other types of sugar printing have been previously explored, but have problems with the sugar burning or crystallizing, said Matthew Gelber, the first author of the paper who recently graduated from Bhargava’s group with a Ph.D. The Illinois team found that the sugar alcohol isomalt could work for printing applications and is less prone to burning or crystallization. Then they had to build a printer that would have the right combination of mechanical details to print stable isomalt structures – the right temperature, pressure to extrude it from the nozzle, diameter of the nozzle, and speed to move it so it prints smoothly but then hardens into a stable structure. See a video of a bridge model being printed. The Illinois researchers partnered with Greg Hurst at Wolfram Research in Champaign to create an algorithm to design scaffolds and map out printing pathways. 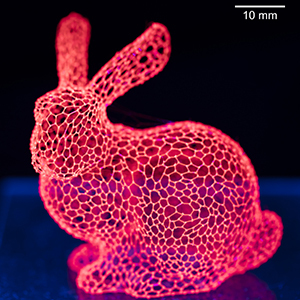 One advantage such free-form structures hold is their ability to make thin tubes with circular cross-sections, something not possible with conventional polymer 3-D printing, Bhargava said. When the sugar dissolves, it leaves a series of connected cylindrical tubes and tunnels that can be used like blood vessels to transport nutrients in tissue or to create channels in microfluidic devices. Another advantage is the ability to precisely control the mechanical properties of each part of the structure by making slight changes in the printer parameters. A 3-D printed bunny made of isomalt sugar mixed with a glowing red dye used in biomedical imaging. 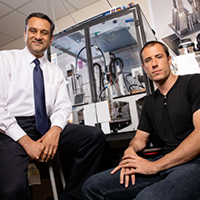 Bhargava’s group is already using the scaffolds in a variety of microfluidic devices and cell cultures, and it is working to develop coating for the scaffolds to control how quickly they dissolve. 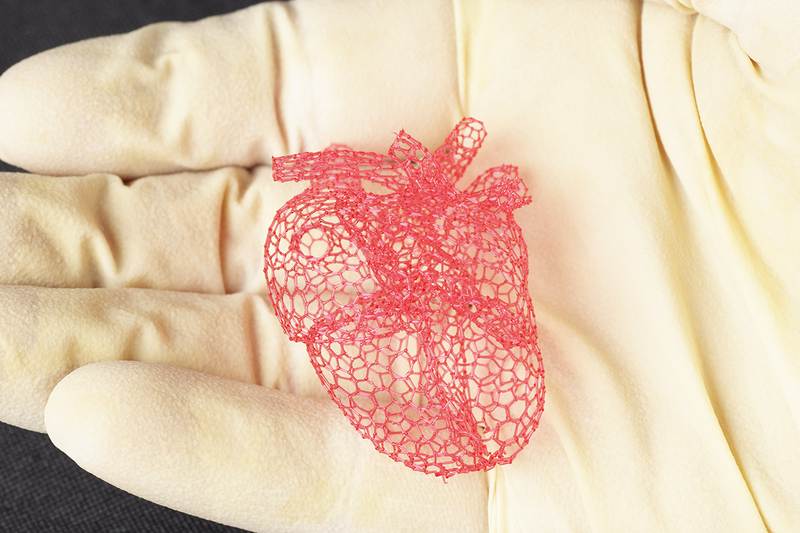 The Additive Manufacturing paper is part of a series of publications based on Gelber’s thesis work that details how to build the printer and the planning algorithms necessary to operate it, as the researchers hope that others can use their models to build printers and explore various applications for isomalt structures. The Beckman Institute for Advanced Science and Technology supported this work through its seed grant program. Bhargava also is affiliated with the Beckman Institute, the Carle Illinois College of Medicine and the departments of electrical and computer engineering, mechanical science and engineering, and chemistry at the U. of I.
Editor’s notes: To contact Rohit Bhargava, call 217-265-6596; email rxb@illinois.edu.